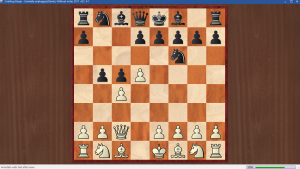 There are few d-pawn openings more exciting and dynamic than the Benko Gambit, and in the recent league match between Forest Hall Admirals and Morpeth A showed a classic example of free-flowing tactical play that arose from the Benko. The player giving the masterclass was our new board one, Grandmaster Danny Gormally, and his comments on the game can be seen below (at the end of this post) in his instructive YouTube video, recorded the day after the match. The great advantage of the Benko is that there is almost no way for White to take the game down boring channels or to take an easy route to a draw. Both sides have a fight on their hands, whether or not White accepts the pawn sacrifice! coaching session. Many professional players, such as Danny Gormally and Speelman, now offer lessons by Skype. Now that White is threatening e5, this move is necessary. 9. h3 is apparently a theoretical alternative. 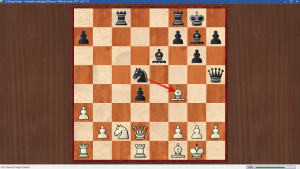 This move was criticized by Danny, as at least temporarily it blocks in the c1 bishop. More natural looks 10. Bf4 Nb6 11. Nbd2 and White is always looking to see if he can get the e5 pawn break in favourable circumstances. Roger protects his bishop, but Danny’s suggestion may make more sense: 11. Rb1 Na6 12. a3 Nc7 13. b3 and White is getting ready to challenge (and swap off) Black’s key Benko bishop at g7. Probably the right idea. Opening up the centre seems safe enough now – and remember, Black is not a pawn down as he is in many Benko lines! Another typical Benko-style idea would be 11… Na6 12. a3 c4 $5 saccing the c-pawn in the usual style, when Danny felt Black would have reasonable compensation. On the other hand, 11… f5 might be a little risky, and Danny pointed out that White can reply with a dangerous central pawn sacrifice of his own: 12. e5! Nxd5 13. exd6 exd6 14. Bc4 and White ‘is probably going to win material’ – Danny. 18. Re2 Rxf2! Now this sacrifice secures Black a more or less equal game after:}19. Rxf2 Rf8 20. Nf5 exf5 21. e5 f4 22. e6 f3 23. Kh1 Bxf2 24. Qxf2 fxg2+ 25. Qxg2 Qe3. An alternative for Black would be 14… Bxc4 15. Bxc4 Qf6 16. Bc1 Nb4 17. Qb3 Nxc4 18. Qxc4 Rfe8. 15… Bxc4 16. Bxc4 Qf6 (16… Nxc4 17. Qxc4 Bxb2 18. Rad1, or 16… Bxb2 17. Qxb2 Nxc4 18. Qc3) 17. e5. moves look fine for Black. Now Black gets a strong initiative. Danny said he was worried by the possibility of 17. Nfe5 blunting the g7 bishop, but after Rad8 18. Nxb6 axb6 19. Bc4 Qb7 20. Bxe6 fxe6 and Black has the strong idea of taking the knight at e5 and playing Nd3. 17… Qh5 18. a3 Nc6 19. Ne3 Nd4! The weakness on b3 starts to tell. Now Black is well in control, with very active pieces and an annoying passed pawn on d4. Not 22. Ba6 Bf5 23. Bxc8 Rxc8 24. Rd2 d3 and Black wins. Taking on d4 would be a blunder: 23. Nxd4 Nxf4 24. Qxf4 Be5! and wins. A horrible weakening, but there was nothing else. White is already lost. What is the best move now to break through? A lovely exchange sacrifice, which leads to a massive attack on White’s king. An amazing idea that most humans apart from super-Grandmasters would struggle to find. The far-from-obvious point is that Black is threatening to bring his rook to c8. Then White would not get a check in taking it, and the White queen would crucially be diverted away from defending the kingside. For example: 30. Rd3 Qe5+ 31. g3 Rc8!! 32. Qxc8 Qe4 and mate is unstoppable! If 28. Rab1 Ba2. Now comes a brilliant dismembering of the White king position. Black’s queen and two bishops will take White’s king apart. With best play now, he will practically be hung, drawn and quartered in a very public execution. Here Danny says he regretted not finding the immediate win. 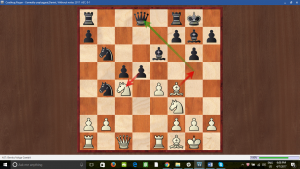 The way to do it was: 29… Bd5+! 30. Kg1 (if 30. 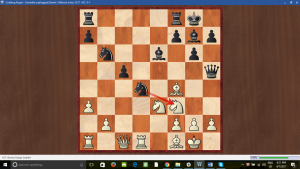 Kf1 Qh3+ wins) 30… Qg4+! This is the intermediate move (before Qf3) that Danny says he didn’t see in his calculations during the game. 31. Bg3 Bd4+ and the queen is lost. This is also very good for Black, but it takes a bit longer. “A tricky move by Roger.” – Danny. (33. 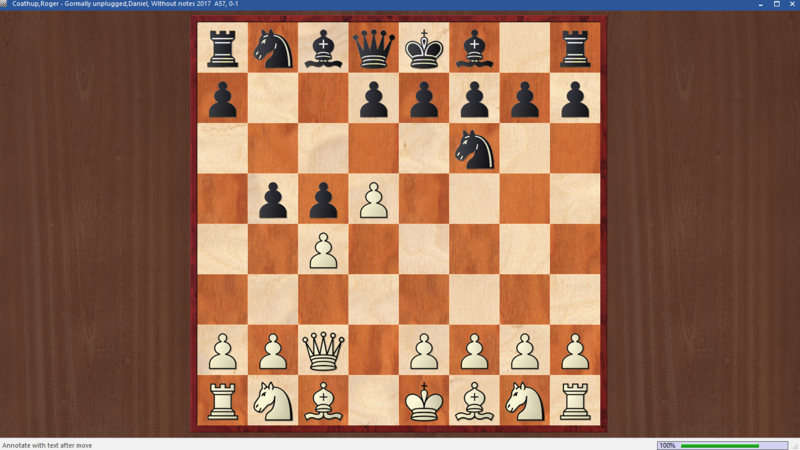 Qe2 falls for the John Nunn LPDO principle, or ‘Loose Pieces Drop Off’ : 33…Bg2+ 34. Kf2 Qd4+. A fine example of attacking play in the Benko by Danny Gormally. While the game was perhaps a little messy in places, that seems to be how he likes it. 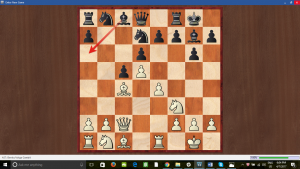 Black’s play in all parts of the board – queenside, centre and kingside – in the end was quite formidable. Next Still time to enter the Easter Congress!